You need a consultation with your dentist in Westmont to ensure you are a candidate for dental implants. There is an office fee for the appointment; however, many locations offer the consultation for free or your dental insurance may cover a portion of the cost. Besides a visual examination, your dentist takes x-rays and CT scans to evaluate the health of your mouth and your oral structures. On average, the cost of the images can range from $25 to $200. Depending on your specific policy, your insurance may pay for them. It is not uncommon to need additional procedures prior to having your implant posts placed, such as tooth extractions or bone grafting. Bone grafting ranges from $250 to $1,100 if a synthetic bone is used while tooth extractions cost $75 to $650. Often, you can use your insurance to help lower the cost. If your treatment is not performed from one location, you will need the help of specialists, such as an oral surgeon and anesthesiologist. You will have to pay their fees in addition to your dentist’s office fees. If an oral surgeon is needed to place your posts, their fees are around $500. You will also pay for the cost of the implant posts. On average, they are around $1,600 to $2,000. That amount will vary depending on the material and type of implant that is used. 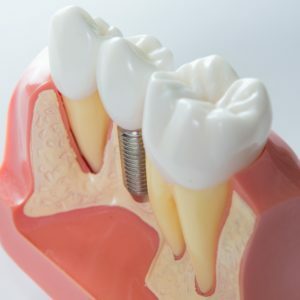 After your jawbone has fused to your posts, abutments are attached to connect your custom-made restoration. You will pay $275 to $450 for each one that is needed. Often, the most expensive aspect of the treatment involves the restorations. A single crown can cost up to $3,000 while implant-supported dentures average at about $7,000. If you have any remaining benefits, your insurance can pay for 20% to 80% of their cost. Although the cost of the procedure can seem overwhelming, it is cost-effective long-term because your dental implants can last forever. To help keep the treatment within your budget, you maximize the value of your insurance policy. Third-party financing, like CareCredit, can be used to cover any remaining out-of-pocket expense. With the right dentist by your side, you can restore your smile using a reliable solution. Dr. Jason Hong and Dr. Kathy Lam strive to provide world-class services for patients of all ages. We treat advanced issues, like tooth loss, to rehabilitate your smile. If you are interested in dental implants, we can help. Contact our office today to schedule your appointment.